The term ART NOUVEAU refers to a decorative and artistic style that is dominated by flowing or natural lines and shapes. It was prevalent between 1890s and 1910s and has influenced all forms of expressive art, including Architecture, Furniture & Fixtures, Decorative Arts, Jewelry, Fine Art and several other branches of creative work. Although it was shortly followed by the Art Deco style, it has revived in popularity in the last decade or so, mostly as a nostalgic element and for its naturalistic and sophisticated aesthetic value. Artisans and studios engaged in this art form in many countries, first in Europe and quickly in the United States. Many historians believe that its rebellious birth around the time that massive industrialization was becoming the norm in everyone's life, often referred to as the Secessionist Art Movement, is not coincidental, but rather reveals a disdain for the "mechanized" or "formulated" view brought about by this new age of severe automation. Art Nouveau's romantic appeal helped in spreading its influence around the world and permeated many Applied Arts of the time. Yet ironically and in spite of its short-lived reign, Art Nouveau transformed the essence of most creative sectors, not just for its gracious visual impact, but also in terms of materials and methods used as a direct product of the Industrial age. Strengthened raw materials and better engineering allowed for improved fabrication techniques, some far removed from the traditional individualized craftsmanship of previous times. Companies. large and small, adopted standardized and highly organized production capabilities, some even using some sort of streamlined division of work into talented modelers or designers, skilled & unskilled labor, marketeers and so on, in order to develop and construct profitable businesses. 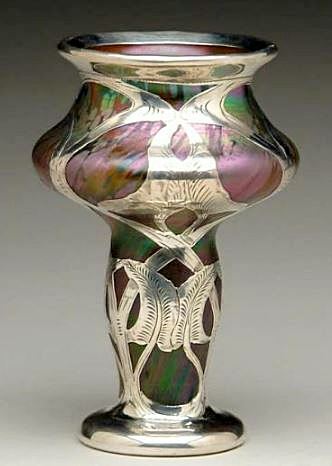 Art Nouveau continues to inspire cultured and well-traveled collectors globally. Besides this style's persuasive attraction, values for Art Nouveau decorative objets d'art have soared over the years and now command high prices at auction. Especially examples that date from its original prime period around the turn of the century, seem to be the most desirable and sought-after. Additionally, certain items marked with a certain maker's logo attract more buyers, even some made by relatively obscure artisans or studios. Therefore, identifying your treasures correctly is important, not only as to who made them, but also when. Checking our Ceramics marks and Silver or Jewelry marks guides can help you to identify and date Porcelain vases & figurines, Silver jewelry and other collectibles from all periods and styles, including Art Nouveau. To locate sales records for Art Nouveau treasures of all types and ages, you can use our Pricing Guides. A few examples are shown below. Victorian Bronzed Inkwell, Art Nouveau floral, pen rest, glass insert.